A map! Any fantasy book that opens with a map herald of good things are coming my way. Same with a glossary of words, OMG, when I see a glossary I get instant bookgasm because I KNOW that the world building is going to be one heck of a visual. 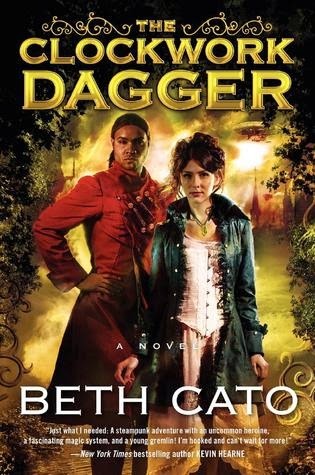 CLOCKWORK DAGGER by Beth Cato is a solid, fantastical, Steampunk that's just amaze-balls! The map in the beginning instantly gave me epic fantasy feels and after reading the book, it does give off that vibe. And I've never read a Steampunk book like this so hats off to BCato for reimagining the genre and leaving it with her own unique mark. CLOCKWORK DAGGER has a few unique things going on for it and here's the standout reasons why I love this hard! It's a duology people! It means the plot is fast paced, the conflict straightforward, and the resolution (I hope) strong. No multiple books to read, wait for, catch up with etc. I mentioned that the world building is a great mash-up of Steapunk and epic fantasy. 95% of the story happened in a dirigible or an aircraft. The myth is very pagan involving a Tree and The Lady who guards it or is probably The Tree herself. The Tree is a powerful life source and people like Octavia are rare and gifted in that they can harness The Tree and The Lady's powers in curing people. The world of CLOCKWORK DAGGER is in turmoil and the people are restless. There's the tyrannical empire on the right and there's the Wasters on the left. Also the backstory behind the ruling royals is reminiscent of Russia's Romanovs down to the legend about the lost Princess, Anastasia. Octavia Leander is a medician, medic/magician, and she is the most powerful medician of her time, maybe ever, and is seen as both a threat or an asset, depending on which angle you're looking at. CLOCKWORK DAGGERs are assassins of the empire and the hero and Octavia's love interest, Alonzo Garrett, is one. I'd also like to note that this is an interracial pairing in case you missed the cover art... which needs so be tweaked IMO. It's not really attractive, right? There's nothing that I disliked in particular but as this is book 1, it only follows that the book dealt with a lot of building and forming so the core of the series wasn't revealed til almost the end. I'm glad you had a good time, I was really mixed with this one I confess. oh it's already on the blog. Posted it a while ago. I haven't read a steampunk yet. This looks pretty good. Great review. Bec McMaster? Her series is romance heavy, you might like that or at least that would be a great place to start. I saw this somewhere esle...can't remember where. Anyhow, Im liking the sound of this....gonna add it to my wishlist. But yeah that cover could use some work. Thanks Braine.... No it's time to watch TWD..YAY! I hope you get to read this soon! Darn you I am trying to get hold of my tbr pile, and now I so need this..maps she says, duology she says..steampunk goodness ...crap.mine. Thank you & you should def read more Steampunk! Ihhh, are you kidding me? Want, want, waaaant! Definitely loved the myth in this one, very high fantasy! This sounds like an outstanding read, I love that is a duology. I am curious is it full of gadgets and gizmos? lol - I tend to groan when I see a map and glossary. This sounds fantastic though! I have to admit, the world building sounds pretty badass. I like that it's a mesh up too. Olivia sound awesome and I have a thing for assassins. Ooh that's a pretty great recommendation here. I guess I'll add this series to GR. I love the sounds of steampunk mixed with fantasy in a fast paced book. I wish more authors would opt for a duology.